When looking closely at a large number of brass player’s embouchures certain patterns emerge, irrespective of the player’s instrument or practice approach. Using two universal features of all brass embouchures, the air stream direction as it pass the lips into the mouthpiece and the pushing and pulling of the lips and mouthpiece together up and down along the teeth, it’s possible to classify all brass embouchures into three basic types. Since each of these three basic embouchure types function quite differently from each other it’s important for brass teachers to understand them, as different types respond to the same instruction in different ways. Understanding what proper embouchure form is for each type will help teachers guide their students more efficiently and also understand when a player is playing on an embouchure that isn’t appropriate for his or her anatomy. When confronted with a serious embouchure dysfunction it can help teachers discover the real cause of the troubles and how to best go about correcting them. Before reading any further it is necessary for the reader to understand precisely what I mean when I use the terms air stream direction and embouchure motion. I recommend that if you haven’t already done so, visit my pages covering the air stream direction and embouchure motion and read through the descriptions and watch the videos. This embouchure type is one of the most common ones. 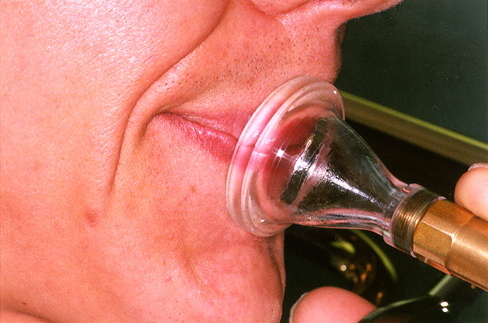 These players place the mouthpiece with somewhere around 75% to 90% upper lip inside the mouthpiece, sometimes quite close to the nose with low brass musicians. Usually these players more or less align their teeth and their horn angle is generally close to straight out. The embouchure motion for this type is to always push the mouthpiece and lips together up towards the nose to ascend and pull them down to descend. Very High Placement type players tend to have an easier time developing their upper register, sometimes having to work harder to open up the sound in their low register. Their tone can usually be described as bright and clear. The Medium High Placement embouchure type is also a very common one. 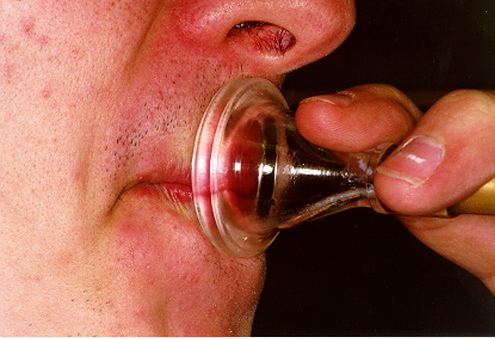 Like the Very High Placement type, these players place the mouthpiece so that there is more upper lip than lower lip inside the mouthpiece, but they tend to place a bit closer towards centered, just over 50% to about 75% upper lip inside the cup. These players also tend to have a slightly receded jaw position and have a horn angle that’s usually slightly tilted down, although there are some exceptions. The main distinguishing characteristic between this type and the Very High Placement type is that the Medium High Placement players always use the opposite embouchure motion, pulling the mouthpiece and lips together down along the teeth to ascend. It’s typical for Medium High Placement embouchure type players to have an easy time developing a dark timbre, although they sometimes overdo this to the expense of their upper register. Flexibility is also often easy for these players. The Low Placement embouchure type is less common than the two downstream types. 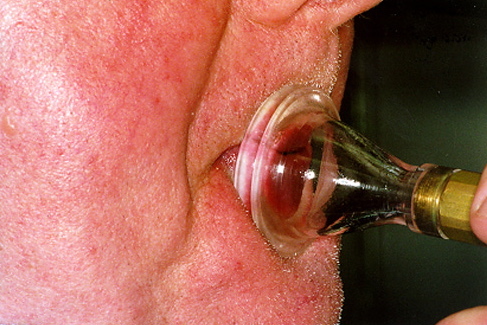 These players place the mouthpiece so that there is more lower lip inside the cup, anywhere from just over 50% to around 90% lower lip inside. There is more variation in horn angle with the Low Placement type than with the other types, but it’s more common to find these players aligning their teeth and playing with a horn angle close to straight out. The embouchure motion for these players is to almost always pull the mouthpiece and lips together downward along the teeth to ascend and push them up to descend. Due in part to the general rarity of Low Placement embouchure types, most brass teachers inadvertently teach these players incorrectly for their embouchure type. Players belonging to this embouchure type also seem to be a little more sensitive to practicing incorrectly for their embouchure, leading many to simply dismiss this embouchure type as wrong for everyone. Low Placement type players will often have a bright tone and find high range to be one of their strengths. Everything can feel very easy when things are working properly for the Low Placement type player. When something is just a little bit off, however, these players can end up in a downward spiral. It’s important to understand that the above embouchure types are not choices that the individual player or teacher should be making, but are rather based on what type works best for the individual player’s unique anatomical features. Many players play on an embouchure type that is not ideal for their physical characteristics, sometimes even playing pretty well this way, but it never works as well as playing on the embouchure type that is correct for the player’s face. Some players even will switch between two types for different parts of their range, which result in a noticeable embouchure “break” and playing flaws that require constant work to cover up. There are players who have experienced a complete breakdown in their embouchure resulting from playing incorrectly for their anatomy. Using embouchure types as useful models is not a new development in brass pedagogy. Donald Reinhardt was the first person that I’ve discovered who made them an important part of his pedagogy. I learned about this from one of his former students, Doug Elliott, who also simplified Reinhardt’s embouchure types and terminology into the three basic types and terms I use here. This essay is really only scratching the surface of a very complicated and little understood topic. If you’d like more information about brass embouchure types I recommend that you watch a video I’ve uploaded in 6 parts that covers these embouchure types in greater detail. Dear friends, Dear David: thanks for your nice website.Perhaps you have a look at http://www.embouchure.nl. What is your scientifical approach? Keeping your mouthpiece more on the upperlip inhibates the fonetic positioning of throat, tongue and mouthcavity/X ay investigation and research prove it.Do you know Matthias Bertsch out of Austria. Perhaps, but I doubt this holds true for all players. My embouchure works best with the rim of the mouthpiece placed on the red of my upper lip. That’s not where all players will find it works best, but it does for many. I’ve looked through your web site some, but can’t find this research sited. Hard to find it, though, since I don’t speak Dutch. I’m a trumpet player and teacher from Germany and noticed your excellent webside per accident! And I have a question! What can you do, when you have a student, who cannot get the chin flat and down? What can you do, when you have a student who plays with air pockets in the lower lip? Do you have a tip for me? Hi, Helmut. Thanks for stopping by! I see those characteristics as symptoms of weak embouchure form in general. It’s good to correct them, but very hard to do so simply by trying to not bunch the chin or play without air pockets. The following page may give you some useful suggestions. It’s specifically related to the bunched chin, but much of what I wrote there also applies to strengthening the embouchure formation to reduce or eliminate the air pockets under the lower lip. I will try your tips and let you know, what happens!! What is your physical approach to the high range with your upstream embouchure? Growing up I always spread my corners into a wide smile to play up high. I’ve always been told not to do that, and I’ve found myself that it’s not easy to come back down without removing the mouthpiece from my face and resetting, and also it tempts me to use a lot of mouthpiece pressure. I have never yet figured out the proper alternative though. Without smiling/pressure, I just don’t play very high. I’ll keep looking through your site in case you’ve already covered this. Upstream embouchure players commonly have the “smile embouchure.” It works, to a certain degree, but eventually limits your upper register, endurance, and sound. I recommend you keep your mouth corners locked more or less in the same position they are when at rest while playing. This will be challenging at first and it can feel like it doesn’t work as well as smiling to ascend. Once you develop the muscular strength and control it should work even better. Is it possible to schedule a lesson with you? I’m a freshman in college studying trumpet performance and I’ve been having embouchure issues for years. That depends on where you live, Ethan. I live in Asheville NC. If you are able to make it out to me on a time when I’m free, I’m happy to help you out. I’ve a jazz studies student going into my third undergrad year, I’ve been reading a lot of posts on your blog and trying to reasearch if an embouchure switch would be smart for me or not, especially right now. I realize in many cases, being asymmetrical is the cause of a embouchure change itself. I feel this is because I am missing a couple of teeth in addition to having 3 wisdom teeth I need out. I had braces in high school and wear a retainer currently. There could be a chance that as my teeth and jaw straighten, range and endurance in my natural low placement embouchure expand in addition to working on no pressure and flexibility. I wonder if I was to make this change now if it would be worth it. Although I’ve gotten a couple of lessons from the classical trombone professor am one of two jazz trombonist at my university. There is no jazz trombone instructor that I would get consistant trombone instruction but am I’m in the great hands of Derrick Gardner,learning a ton. I think it would be much easier to change embouchure when I have a trombone instructor to walk me through the process as I don’t know how long it would take. I have a recital coming up, playing lead in several groups in the area and in the school of music and worry that if I was to change now I could take a step back and would just have to do so again later as replacement teeth and jaw structure would make it nessecary to do so in the future. I do however see potential in the change as it could make my playing much more efficient. Just wondering on your thoughts on if a change may be the right move and if so, it would be wise to perhaps continue to work on all other elements of my playing and change embouchure only after my dental work was complete. Thanks in advance!! Another option that I recommend is to contact my teacher, Doug Elliott, through his web site: http://www.dougelliottmouthpieces.com/prices.html Doug teaches Skype lessons and is one of the best folks out there for diagnosing and troubleshooting brass embouchures. I’ve discovered that in my lower register I play downstream and my upper register i play upstream. I would say my mouthpiece placement is low but I’ve been struggling with getting upstream to work in my upper register and I think it’s causing chop problems. Is it possible to switch to a downstream as I think it would work better for my anatomy even though it wasn’t the way I initially learned. I’d have to watch you play to give you any advice, Ben. If you can post video, I’ll take a look.